“Simon’s mother-in-law was in bed with a fever” (from Mark 1:29-39, Epiphany 5B). You know what that’s like, right? Picture that in your mind. She’s in bed, flat on her back. No energy. No enthusiasm. She is separated from family, friends, and her usual activities. She’s alive but not really living, certainly not to the fullness she wants. Her world is as small and flat as her bed. She is confined to a horizontal existence. It’s not hard to imagine. Every one of us has been there. At some time or another we’ve all had fever. Some of you may be here today in the grips of fever. I’m not talking, however, about the kind of fever that comes with the flu or a cold. I’m not talking about an increased body temperature. I’m talking about those times in our lives when we are disconnected from the vertical axis of our lives. I’m talking about the fever of disconnection. I’m talking about the kind of fever that disconnects us from the divine life and a transcendent existence. It leaves us horizontal and disconnected from the source and origin of life; disconnected from love, joy, forgiveness, beauty, justice, mercy, compassion, generosity, wisdom, and all the other divine attributes that give meaning to our lives, content to our relationships, and direction and purpose to what we do. This fever begins as a disconnection from the mystery and depth of God. It’s symptoms are our disconnection from life, each other, and ourselves. Sometimes there’s not a clear explanation for how that disconnection happened. Sometimes it’s the circumstances of life and it’s not really anyone’s fault. Other times it is our fault; choices we’ve made and things we’ve done. And sometimes I think we just forget or we get tired, lazy, too busy. Let me give you some examples of what I mean. Have you ever found yourself looking at your life and saying, “There’s got to be more than this?” I remember the night, many years ago, when I was still practicing law, sitting in my office with the lights off and staring out the window at Corpus Christi Bay. It was beautiful but I couldn’t see the beauty. Outwardly nothing was wrong. I was married. I had a child, a house, two cars, a boat, and a cat. My practice was successful. I had good clients and lots of work. I had friends. I was involved at church. That night my only thought was, “Is this all there is?” Something was missing. My world was flat and my life disconnected. I was running a fever. The day my wife and I came home from the cemetery, having just buried our son, we lay on the bed. There was nothing to say or do. There was no joy, life seemed empty of meaning, and hope was a nice word printed on a sympathy card. The fever of death, sorrow, and loss had taken hold of us and we had been flattened. Everything was disconnected. Every time we make a confession, privately or corporately, and we name the things we have done and left undone, and the ways we have not loved God with our whole heart and our neighbor as ourselves, we are diagnosing the fever of disconnection. Have you ever had times in your life when you were so tired, so busy, so preoccupied, so overwhelmed, or so whatever that you just skimmed the surface of life and there was no depth or dimension to what you did or who you were? Everything felt, looked, and sounded shallow? In those times we are disconnected from the vertical axis of our life. Fever has overtaken us and there is only the horizontal. Most days I read the news and cannot help but wonder if we are standing at the edge of a flat world, disconnected from something greater than ourselves. War casualties, the poor, the hungry, the homeless, battered women, abused children, refugees, those denied education or healthcare are just some of the degree markers on the world’s thermometer, and the temperature is rising. The pandemic fevers of power, greed, hatred, prejudice, injustice, and violence are raging and human beings are dying. Perhaps the only fever worse than these is the fever of apathy and indifference, to be so disconnected from the vertical axis of God’s life that the life and well being of another are not our care or concern. I suspect many of us live with those low grade fevers of self-importance, excessive busyness, the desire for control and security, the drive for success and perfection, the need for approval and recognition. They might be disguised as hard work and just reward but the disconnection is still real. Some of you might recognize in yourselves the fevers I have described. Others might not. But I’ll bet every one of you could name times when you have been feverish, times when you felt disconnected, flattened, and confined to a horizontal existence. The fevers of our lives and world are many and varied. Regardless of how it comes about, the fever of disconnection kills; sometimes physically, sometimes emotionally, always spiritually. The antidote for this fever is to reconnect with the vertical axis of our lives. Christ is both our vertical connection and the means by which that connection is restored and sustained. He knows and reveals the way of restoration. He breaks the fever. Isn’t that what happens in today’s gospel? Isn’t that what he did for Simon’s mother-in-law? Jesus “took her by the hand and lifted her up.” She was no longer confined to a horizontal existence. She stood upright. Jesus broke her fever and restored her vertical connection. With that restoration all the other connections of her life were renewed. She was returned to her family and community, and “she began to serve them,” not as an act of submission but as evidence of life and as an offering of hospitality and gratitude. When the women got to Jesus’ tomb the angel told them, “He has been raised” (Mark 16:6). In every one of theses stories the vertical connection was restored and life was returned. 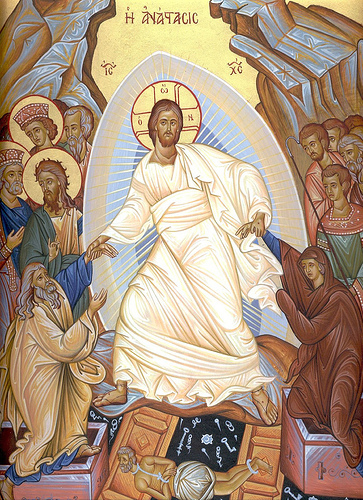 Look at an icon of the resurrection and you’ll see the same thing. Jesus has taken Adam and Eve by the wrist and is lifting them up from the grave and out of death and darkness. They are no longer confined to a purely horizontal existence. Jesus has restored their vertical connection just as he did for Simon’s mother-in-law, and just as he does for us. He gives us a hand in our daily struggles to stand upright and maintain the vertical connection. Christ’s hand touches our lives, breaks the fever, restores the connection, lifts us up, and raises us to new life. I know this to be true. I’ve felt and continue to feel the hand of Christ lifting me to new life and breaking the fever of death. So tell me. What are your fevers? Where is your life disconnected? In what ways are you confined to a horizontal existence? Christ will break your fever of disconnection, heal your life, and make you whole. 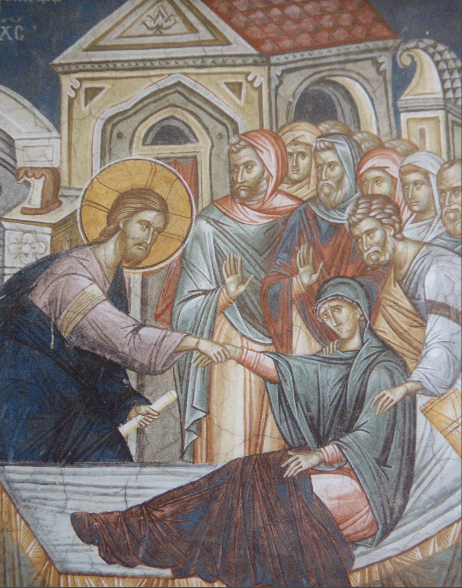 Christ’s hand of resurrection breaks the fever of death. Christ’s hand of forgiveness breaks the fever of guilt. Christ’s hand of mercy breaks the fever of condemnation. Christ’s hand of peace breaks the fever of conflict and violence. Christ’s hand of consolation breaks the fever of sorrow and grief. Christ’s hand of hope breaks the fever of despair. There is no fever the hand of Christ cannot or will not break. Christ breaks every fever. In him every broken connection is restored, every flat life is lifted up, and every horizontal existence is raised to a new life on the vertical axis. “Simon’s mother-in-law was in bed with a fever, and they told [Jesus] about her at once. He came and took her by the hand and lifted her up. Then the fever left her” (Mark 1:30-31). “The fever left her,” and the fever will leave you. Lawrence, I like the tension you created between the psalm and Paul’s words. I suspect it’s a tension that we’ve all felt and mirrored by the tension of the cross and the empty tomb. This feels as if written for me in this particular moment. So, thank you! Thanks Julien. I hope the fever breaks soon. Yes, I think it most certainly speaks to me right now. Thank you, Fr. Michael! God’s peace be with you Jan. I hope you all are well. Judy, your words remind me of Bl. Paul Giustiniani’s prayer, “According to your infinite Majesty and boundless Goodness life me up and I shall live again.